Last night’s episode was a good scene setter for what I think will be a lot of exciting episodes to come. 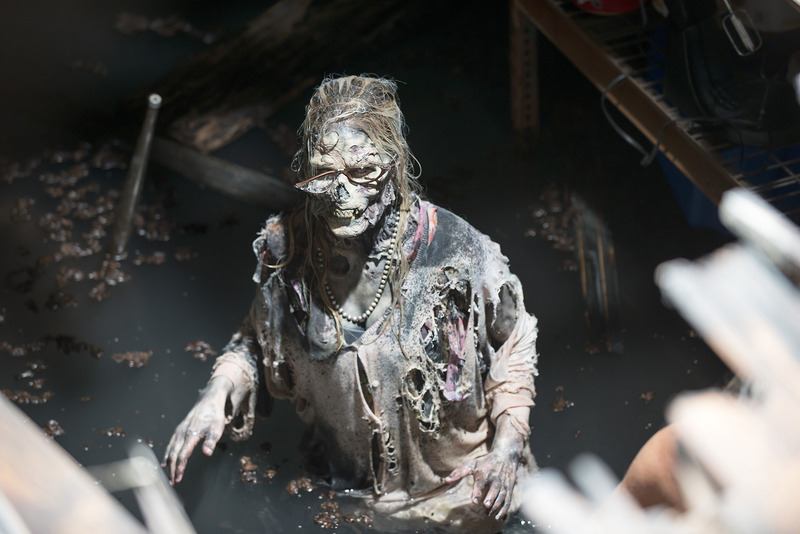 With The Walking Dead, each season or two seem to centered around a specific place or getting to said location. They have visited the farm, the prison and traveled to and left like a bat out of hell from Terminus. I have always enjoyed Season 1 because they were not trying to get anywhere, they were just trying to survive. In last night’s episode they came upon a church and whether they will stay there or not I am not sure. I really hope that this doesn’t turn into the church season. I really would like to see them hit the road and to find Beth. Is it just me or does it feel like no one cares that Beth is missing other than Daryl? Hello people remember the little blonde chick, you know the one that drank moonshine in the woods, the one who had the coolest dad ever and before Tyrese was the best babysitter? Enough with my ranting, let’s discuss the episode at hand. The crew starts trekking through the woods as they leave Terminus. Everyone seems to be in really good spirits, which we all know is never EVER a good sign. Bob and Sasha have confirmed their love and keep sneaking kisses in as they walk. They both seem truly happy and like they are walking on cloud nine. All of a sudden in the far off distance they hear cries for help and Carl instinctively wants to help. They go off and find a man on a rock about to get chowed down on by a couple of zombies, kicking and screaming for help, the team of course save him. When he comes down, we see that the man is a priest, Father Gabriel, he is scared and Rick asks him, if he has ever killed a man, to which he responds that he would never harm or kill anyone. He tells them that he has a church and that is where he has been hiding out this entire time. Needless to say everyone is very suspicious about this mysterious priest and the fact that he has never killed a walker. Very weird! At the church Father Gabriel tells them he has been living off food from the canned food drive that took place before the zombie apocalypse went down. He tells him there is one place left for them to forage for supplies, but it is filled with walkers. Rick tells the crew that they will go there and get supplies. Abraham and his crew do not want to stop, but the rest of the team agrees that they will abide by what Rick wants them to do and they will not split it up again. Before leaving Rick gives Carl a talk and tells him that he cannot trust everyone, even this supposed man of God and that he needs to never let his guard down. When they arrive at the food bank with the Father in tow, they see that all the food is inside of a hole in the ground. It has filled up with water and the walkers are down there treading and getting grimy. 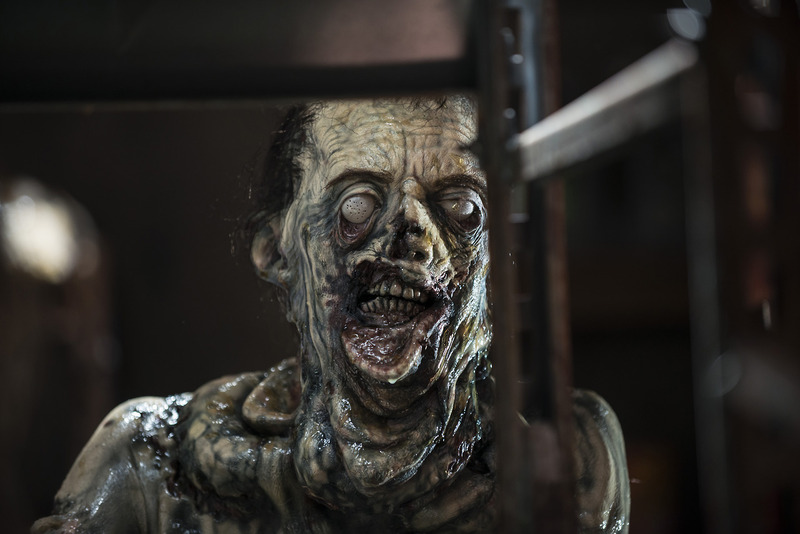 I have to say those were the grossest walkers I ever seen! They set up a plan and manage to get everything out, meanwhile the Father is scared out of his mind at the sight of the zombies, in particular one with glasses. Doesn’t she kind of look like Norman Bates’ mother from Psycho? Also, Bob misses getting bit by like a hair. I swear ever since we were introduced by Bob, every episode I think he is going to die. After they get food and supplies, we get a little revelation from Michonne. She no longer has her sword and admits that she doesn’t miss it. 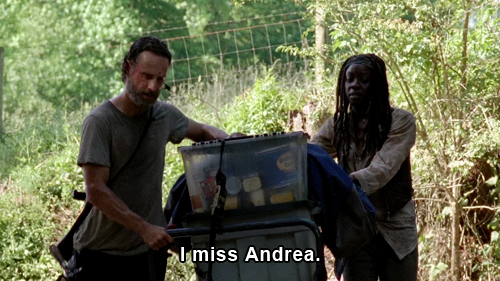 But she does miss Andrea and Herschel. Seriously how sad was that?! Carol and Daryl (cue the song “Just the Two of Us”) load up on water and come upon a car on the side of the road. She decides they will leave it there in case they ever need to make an emergency exit. What would they do without Carol and her good ideas at this point? Daryl jokingly throws one of the jugs of water on the floor away from Carol’s grip. I don’t know if he did that as a joke or is he acting out for some reason? When they get back from the run Carl shows his dad a carving that he found outside the church. It says, “you’ll burn for this,” and in seeing this they both realize the Father is hiding something from them. Good detective work from Carl! Also, Father Gabriel pulls out a picture of a woman with glasses and himself. Bingo, that is the Norman Bates zombie! Back at the church, they have a feast for the ages at night. Abraham again asks the group if they will be going with him to Washington and help Eugene enact the cure. Rick says that he is in and if he agrees then everyone pretty much else does. Everyone is laughing having a good time and it just seemed way too weird for them to be that happy. I haven’t seen them act like this since the first day they were on the farm enjoying food with Herschel and his family. Seriously folks do not get too comfortable. Once they are done eating and laughing and acting jovial, Bob and Carol both separately step out. Carol goes off to the getaway car of course and Daryl follows her. As they are talking a car with a cross on the back goes screeching by them. Daryl yells out for Beth and they follow the car. 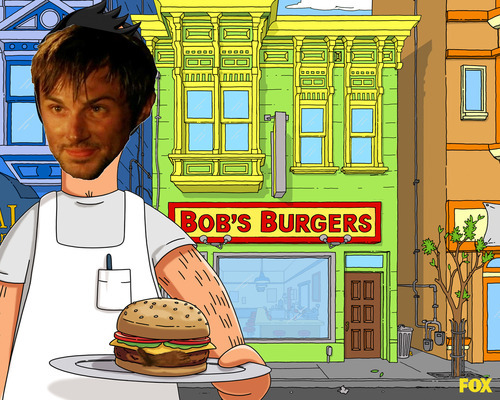 Bob goes outside to have an epiphany of sorts. He looks like he is on the verge of tears. Is he happy because he escaped from being bitten, or because he finally met the love of his life with Sasha or was he jonesing for a drink? I am not sure why do you guys think he was crying? Out of the blue comes the car and they grab Bob and knock him out. When he awakens he sees Gareth in his face. He gives him a whole dialogue about how they are all alike and that this is how they are surviving. They roasted Bob’s leg and are gleefully chomping down on it. OMG GROSS, yes they went there. Just when Bob was happy and was about to get some with Sasha. 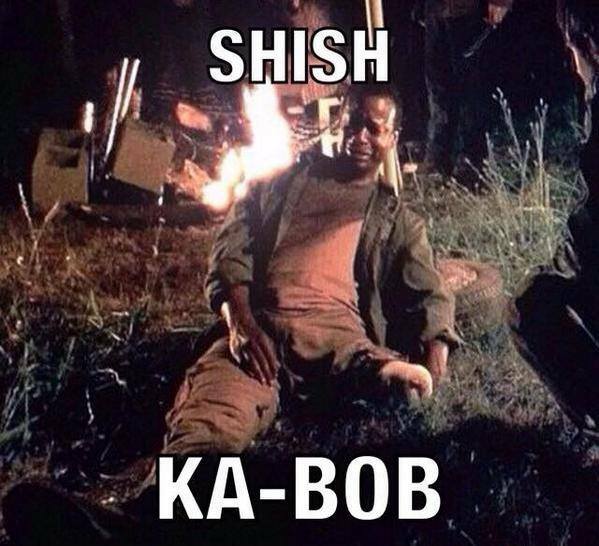 Seriously that was the grossest scene thus far on TWD. What did you guys think of the episode? How do you feel about Bob being the latest victim? If Herschel can go around with part of his leg missing, I think Bob can too. Until next time kids, for now here are some pics to make you feel better about not being part of the Sunday Funday Bob-BBQ. 1. Yeah, what the hell? Why has no one mentioned Beth?? 2. The preacher guy is weeeeiiiiiird. 3. I knew Bob would be next! The whole episode was leading up to that. Lol… Umm… Yeah, kind of gross at the end there. He COULD survive that, though, yeah?? great recap Mel! I love how no one is safe in this show and to start off the season with this was great. yep, that scene grossed me out too. Thanks Rob! Seriously do not trust the preacher. But seriously where is Beth?! Me too!! I’ve had a crazy month at work, but as of this week should be back to normal. I know right, we get used to talking to each other everyday and you really do feel it when you don’t talk as much anymore. Awww well we are back in action girl! Yeah it’s been a whirlwind couple of weeks for me too, looking forward to a bit of normalcy and catching up on ppl’s blogs! I’m crushing a bit on the actor I met at TCFF, he made me forget about Toby, even just for a little bit!! He’s much younger than me tho, and I usually don’t find younger actors attractive but he’s just sooo dreamy! The more I talked to him the more I got smitten and I actually talked to him every day for 3 straight days. Trust me, it was so easy to fall for him, there’s another girl who’s crushing on him too so we both have been commiserating, ha..ha.. Yes seriously it is a lot of work, thank goodness you have a team helping you out. Did you ever find out if you are coming to San Diego in Nov? UH OH someone is battling for your heart???? No way, is it the George Finn guy? He is super cute, kind of reminds me of Adrian Grenier and Aaron Taylor-Johnson as you mentioned. Is it him? Oh I don’t think I can go to SD this Nov, lots going on w/ my hubby’s mom so we might have to visit her instead or have her over for Thanksgiving. Sorry I really want to meet up w/ you! Ha..ha.. yeah, that’s him 😛 I mean isn’t it obvious in the interview? He’s so beautiful, really, even more so in person than on screen. And his personality is just so warm and friendly, no pretense. I LOVE Aaron too but I immediately think of Cillian Murphy because of his eyes, piercing blue. I love ppl w/ dark hair & light eyes, that contrast is striking. Plus he’s got bedhead hair every day, which makes him even more adorable! Aww but I understand you have to take care of family first. I was just checking on the status. Oh of course it is him! He is super cute and the fact that he was nice and sweet in real life is pretty awesome. When he becomes a big star, you can say you met him. Very cool! Toby better watch out!